or even a bad wheel bearing noise. When you hear a rattling sound, the source can be one of the many parts of the engine and exhaust system. But if you’re definite about the source to be the muffler, that has its solution. Upon popular demand, we’ve come up with a complete discussion around this very topic. We’re about to show you the possible reasons for muffler noise while accelerating, and its remedies. A muffler is a part of the exhaust system, and it’s installed onto the exhaust pipe. And the job of the muffler is to reduce the noise that comes from the engine section. The structure of the muffler consists of perforated tubes or chambers. It creates opposing sound waves that prevent the engine noise to come out. As a result, the muffler cancels the harsh and loud noises that come out of the engine. As a benefit, you don’t get bothered by the highly irritating engine noise. Now, what is the source of the rattling noise in the muffler? Especially, while you’re speeding the car up. Well, there are many components that are nearby the exhaust pipe. The items can be exhaust rubber hanger, loose exhaust bracket, exhaust connectors, etc. These items can get accidentally in touch with the muffler, and that’s what creates the rattling noise in the muffler. When you are accelerating the car, the exhaust pipe gets in contact with these items. And that’s what creates this rattling noise. 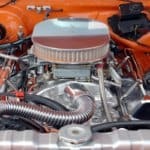 Another possible reason for muffler noise is, there can be issues in parts which are not directly connected to the muffler. Sometimes, metal pipes around the muffler can already be damaged. That might led the exhaust system not to work properly. Consequences of Bad Muffler Noise! The effect of a noisy muffler is not only lied within a disturbance. It has some further impacts as well. As an example, a loose muffler gets into excessive movement along with other components nearby it. So, the adjacent parts will be in stress, which brings in more noise. Eventually, with this variant movement, the muffler can get into a lower position than where it should be. This might turn it to break off by hitting the bump. So far, we’ve been discussing the problems of a noise muffler, and the reasons. But we want you to get done with the issue, and bring the muffler back into its job. So, in this section, we’ll be taking you through a set of steps which will get it done right away. Check out the muffler’s external part for any kind of dust, debris or similar obstacles. 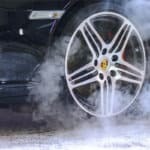 As the exhaust system works as a whole unit, any kind of presence of unexpected materials may lead to several problems like noise, vibration and so on. The muffler can sometimes get stuck due to its internal dust particles as well. Open up the muffler and check for any baffle or other kinds of components. This kind of objects often turns the muffler to come loose and cause internal rattling noises. To clean up the internal dust out of the muffler, you need a car cleaning brush with a long handle. You may consider getting several sizes of it for more proficiency. A loosen up muffler sometimes get detached from the bracket or bolt and cause unexpected noise while accelerating. If you need, you can change these parts with new car bracket instead. Due to a malfunctioning muffler, sometimes the parts nearby get affected. There can be rust or debris around the parts of the muffler if you don’t take care of the muffler noise pretty soon. In extreme cases, some muffler gets into an unrepairable condition. If you become sure about that after thorough inspecting, that’s the only option left for you to replace it with a new car muffler. There are many brands and models available. If you decide to install a new muffler, make sure it suits your car’s model. Take help from the manufacturers if needed. Here a video clip for fixing muffler noise easily! When you are dealing with a problem of muffler noise when accelerating, there is a 90% chance that an uncleaned or jammed out muffler is the culprit behind. But sometimes, that may not be the only issue to take care of. There are other issues available such as loosen up connection, rust-affected parts and so on. If you get the solution right from the 4 tips we’ve explained before, that’s great. In case you can’t figure it out yet, you should take the consultancy of a professional car mechanic instead.